The Marshal Zen Garden is one of priceless treasures in Beitou, located at the unparalleled naturalcultural landscape of the unique Hell Valley area, matched with the nearby hot-springs, important historical architectures, and Beitou Hot Springs Museum. With a history of a centuryplus as a hideaway hot-springs spa oasis, the area’s abundant traces of history can still be clearly discerned in everywhere you see. Marshal Zen Garden facility was part of the complex of the Xin Gao Hotel, built in the 1895-1945, Japanese colonial peroid. In 1920, it was made as a club for the Japanese military; it was also a final R&R spot during WW II for kamikaze pilots before they headed out on their do-and-die missions. After 1949, it became a place of house arrest for Manchu warlord Marshal Zhang Xue-liang (of China’s Xian Incident ) when Chiang Kai-shek brought him to Taiwan. Lucky for us, owners after this period were all devoted to keeping all original features intact – even down to the trees and bushes, including Zhang’s favorite cherry trees. Located directly above the steaming, mysterious Hell Valley, great wafts of sulphurous white steam and cloud often come curling up slowly from the buttom. The building is a centerpiece of a wonderfully pretty tableau, of classical Japanese design, windows intricately latticed, the peaks of the majestic Yangmingshan massif serving as magnificent scenic backdrop. This is a much-loved escape from the city hubbub below, the city’s Arcadia, its Xanadu. Standing here, far away you can clearly make out the distinctive profile of Mt. Guanyin. The view is especially scintillating as the sun sets. Whether day or night, the views of the Guandu Plain and Tamsui River rolling by, like miniature movie sits, are riveting. But seeing is believing – best get out there yourself, don’t you think?! Marshal Zen Garden, which covers 1000 ping (1 ping = 36 sq. ft.), is divided into two main sections, a restaurant and the Emerald Tea House. Both were main areas in Marshal Zhang’s residential quarters. The interior, of Chinese cypress with ancient Japanese atmosphere, has a compelling rustic simplicity and elegance, and the roof tiles were specially flown in straight from specific Japanese makers. Great care and much time has been poured into maintaining the site’s dignity and style, and from the gallery of the Emerald Tea House you can enjoy a good, close look at the exquisite Japanese roof tiling, stimulating a deeply evocative sense of the artistry and ambiance of vintage cultural flavor. The right side of the restaurant was the main living space of Marshal Zhang. In the former master bedroom visitors now see a large, round, 16-person banquet table for eating Chinese cusines. Elsewhere, the former study, guest room, dressing room, and other rooms have each been made into dining spaces with a round table for 10 diners. Spread out along the restaurant’s left side are the abundant ingredients of the expansive Mongolian BBQ buffet, with the soothing musical accompaniment of either a vocalist or a band from Wednesday to Saturday, from 7 to 9 in the evening. 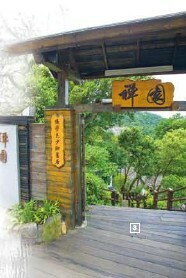 Don’t leave immediately, dear readers, there are more you need to know about!As a bonus for guests, helping them enjoy more in the beauty of Beitou’s hot-springs sites in Marshal Zen Garden, the management has specially installed open-air white-sulfur-spring SPA facilities on the grounds. Manager Ray Chen states that the Garden’s white-sulfur waters are all-natural, unfiltered, and contain minute muddy particles that make it murky. That is, of course, the best condition, for the mineral-rich waters are thus at their most curative. The whitish waters are what locals admiringly call “milk soup”, chock-full of minerals, believed for enhancing the body’s immunocompetence and great for bones, joints, and relieving arthritis. Diners can enjoy a soft, soothing, salubrious soak for an additional outlay of a mere NT$100, making for two wonderful body-stimulating experiences in a single outing.